I love camping and cooking outdoors, but there is nothing like cleaning up in the middle of a camping trip and heading to a restaurant, to make you really appreciate your creature comforts. A few weeks back, my husband and I were camping with some good friends in the Okanagan and we all decided that it would be a nice break to head off to a winery, taste a bit of wine and eat some lunch. 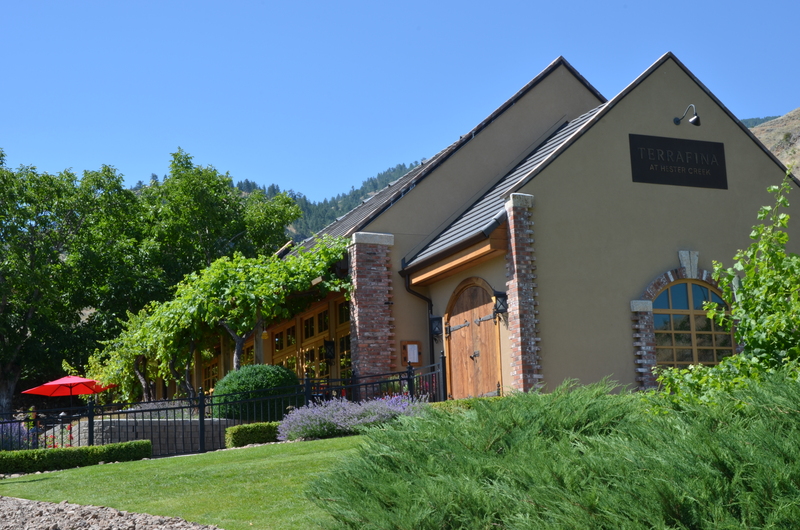 We all jumped in the truck and drove 1 ½ hours down a gravel road to Hester Creek Winery in Oliver, BC and its Tuscan restaurant, “Terrafina”. 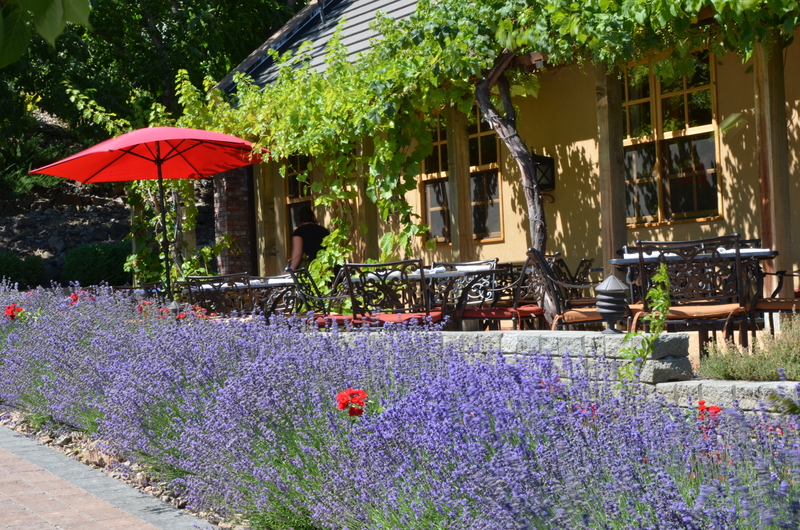 Beautiful patio restaurant at the winery. Beautiful views of the grape vines. Well, we had only been camping for 3 days, but you would think that we had been imprisoned and starved for months, the way that we attacked the menu. Our table of six was oohing and ahhhing at every offering on the menu, creating quite the ruckus. Hmmm…should we have the wood-oven pizza? After some deliberation, both my husband and I chose the Chef’s Special – a Quinoa, Panzanella Salad, which of course inspired today’s post. This is one of those stick-to-your-ribs-I-must-eat-this-again-salads! It was literally the most jaw-dropping salad I have eaten in years! In the end, the Quinoa Panzanella Salad won out. I am taking an overflowing bowl of this salad to Angie’s Fiesta Friday tonight. I know that everyone there will enjoy this robust dish. 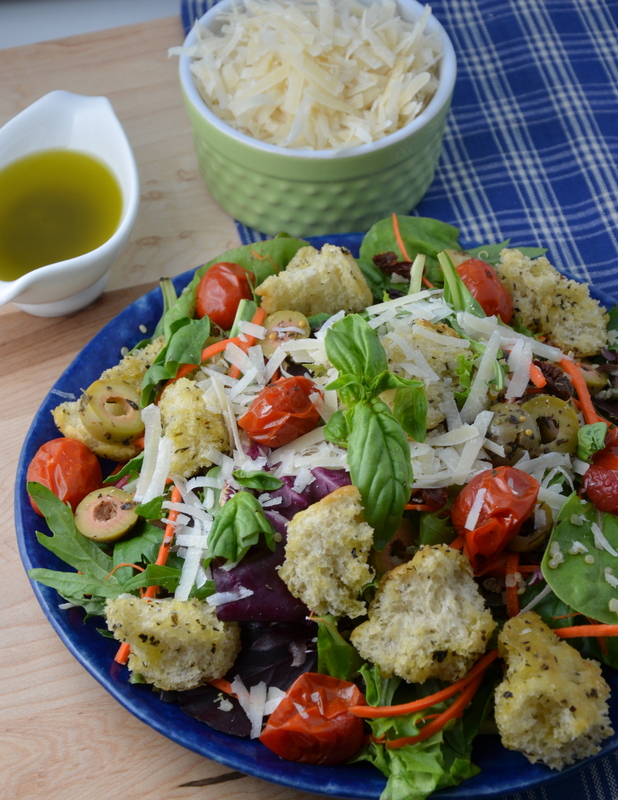 To all of my Italian friends who attend FF, I know this salad is probably not at all the traditional bread salad you make, but I have noticed that there are many variations of the recipe in books and on the internet and now, well, here is another one! Our dear host, Angie is off on vacation this week, so we are very lucky tonight to have our lovely Aussie co-host team, comprised of Saucy @ Saucy Gander and Margot @ Gather and Graze. These ladies are one class act and they do know how to party! So who’s wearing the most sparking gown? Edna? Madge? Let’s head on over and find out! Here is my re-creation of the salad. In a small bowl, toss grape tomatoes with a bit of olive oil. Place on a parchment covered baking sheet and sprinkle lightly with salt and pepper. Roast for about 10 minutes, just until the skins begin to wrinkle. Remove from the oven and set aside to cool. Tear the loaf of bread into big bite-sized pieces and place in a bowl with the oil, garlic and dried basil. Toss so that the pieces of bread are nicely coated. Place on a parchment covered baking sheet and put in oven to toast lightly. When the bread is lightly golden, remove from the oven and set aside. Place all of the salad dressing ingredients in a blender and blend until incorporated. Remove to a serving container. Place all of the salad ingredients in a large salad bowl. Add the tomatoes and bread pieces. Toss with some of the dressing. Divide salad among the plates. Pass extra Parmesan cheese and dressing. Crack open a bottle of crisp, cold rosé (we drank some of Hester Creek’s) and break into song, preferably something Italian! Crack open a wonderful bottle of Rosé to go with this salad! That view! That pizza! That salad! Don’t worry, Julianna. Camping is hard work and not for the faint of heart! I love your take on panzanella. I don’t think I’ve met a variation of panzanella that I didn’t love! Delish! Mmmmm. Love salads at the best of times, and this looks delectable. The quinoa makes it really interesting: it’s not something you would ever expect from an Italian restaurant. Oh thanks Charanya! It was such a beautiful place! I love that you were able to reconstruct a dish that you loved- it looks delicious!! I can fully relate to the joy you felt in re-finding the civilised world (and a delightful winery restaurant at that!) after days of roughing it in the camping ground. 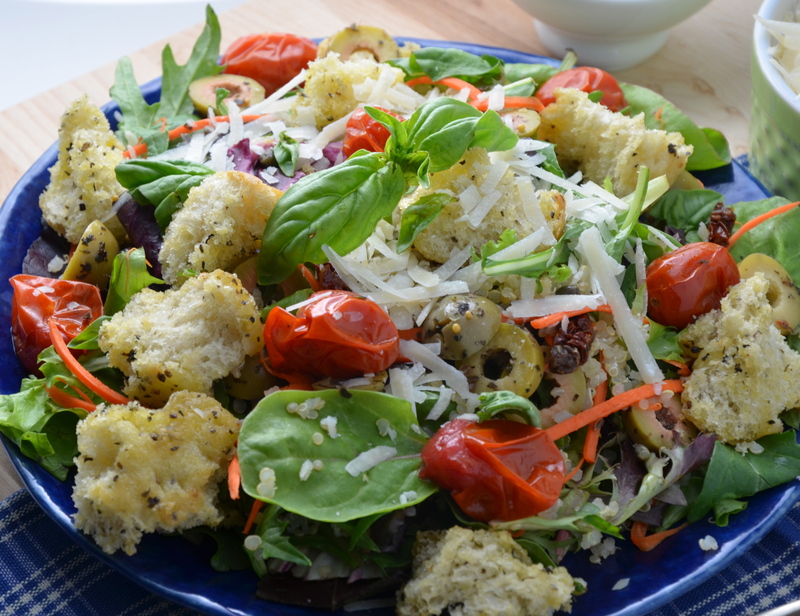 Your fresh, flavoursome salad looks amazing and the dressing (with basil pesto and honey) sounds to die for! Thanks so much for bringing this to the Fiesta #27… I’m now going to grab a plate, before it all disappears! What a gorgeous salad, and one I can make from many of my garden vegetables which are finally ripening. Beautiful pictures of the winery too, but then that is to be expected in BC. Have a lovely weekend. Wow, that winery is beautiful and the salad is spectacular! Thanks so much, Suzanne! The whole experience was very memorable! Loved the pics from your vacation Chef! The panhandle salad looks good and what an interesting take with quinoa in it :). I will try adding quinoa to my salads too :). Mmmm lots of veggies, looks good! 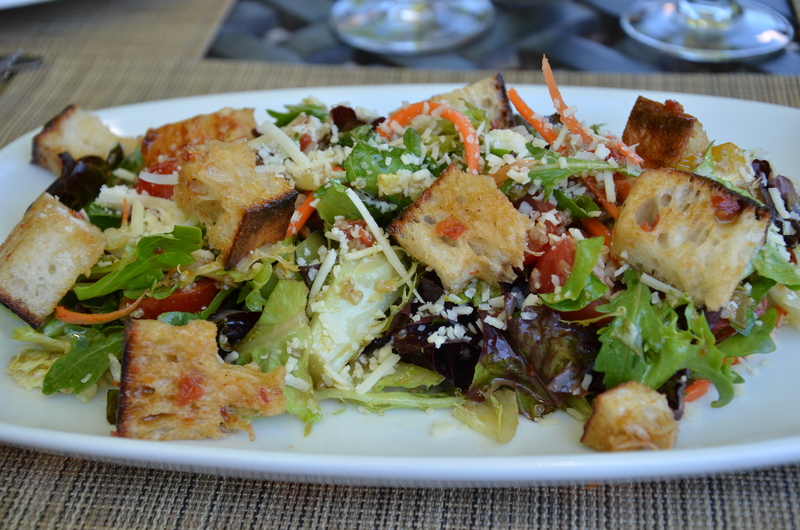 Both the scenery and the food look great, as does this salad, Julianna. What a terrific combination of ingredients and flavors. Loving your header image, too! Also, though it has nothing to do with this post, but it’s on my mind and I wanted to mention to you: Ottolenghi has Plenty More coming out in October! I’m so excited! Happy FF! So glad you like the look of the salad and my new header, Ngan. What? “Plenty More”? Oh, you have just made my day! I can’t wait! I’ll have to pre-order one or camp out at the book store on the release date! 🙂 We can compare notes then! What a gorgeous salad Julianna & healthy to boot! ooh, just noticed the new header, it is so lovely! What a beautiful place – I am not surprised that you all fell upon the food -it all sounds absolutely delicious! I love a panzella salad – the ingredients in your salad sound mouth watering and I would love a big bowl please!! Noticed that you have a new header – Miss Beretta by any chance? It’s fab. Happy Fiesta Friday! – First, I love your new header artwork! 🙂 Or, was it always there and I didn’t notice it before? 😦 Does the caricature resembles you? Thanks so much, Serena! Hope the Italian contingent can handle my rendition of your tradition! Simply beautiful, and oh so summery! Great job! Gorgeous pictures too! Salad is really very colurful and great combo used. Love your story. How true that when you are “roughing it” out camping that you appreciate a restaurant so much more! This recipe looks very tasty and most of the ingredients I have in my garden. Thanks for sharing. Happy FF! A very refreshing salad. Superb photos. And lovely scenery. This salad looks so tasty. And the view of the grape vines is just amazing! I love the way you’ve got all the different lines coming together from different angles. Great shot! I really love your salad recipes. They are so unique and tasty looking. I love the combination of ingredients in this one. What a wonderful salad!! 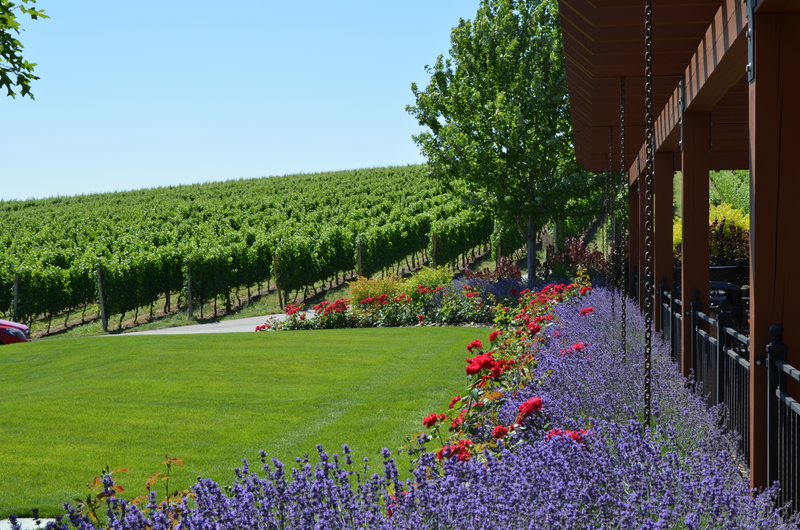 Beautiful pictures of the winery and I love your new theme and header!! Thanks so much Arl. I’m super happy with the new header! Glad you like the pics here! Yikes I’m dying here over those gorgeous lavender plants, the expansive green lawn and the vineyards. Nice trip! I love this wonderful, healthy salad, too. Very summery and thanks for bringing! Oh, this salad looks so good. I love the sound of the caper and the olives, I have to try it! 🙂 Yum! Wow! That view is so beautiful, Chef Julianna. 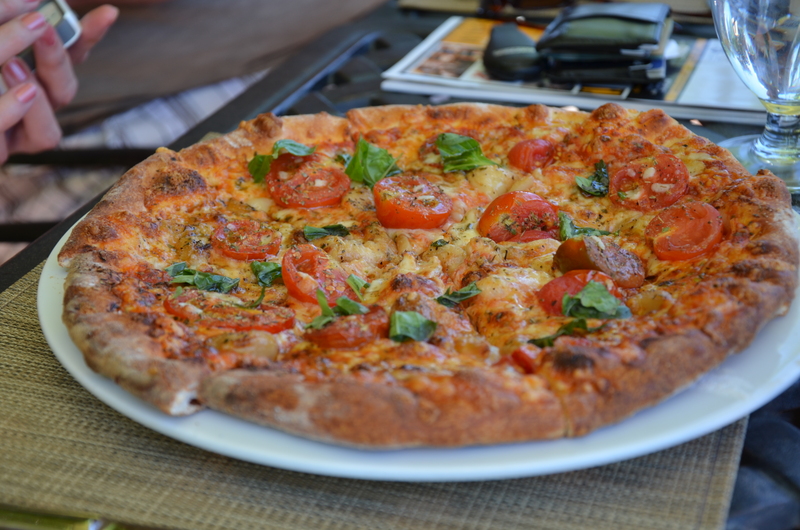 The pizza and that salad of yours – delish much! Lovely salad! Any salad with quinoa in it is great! What a lovely salad! 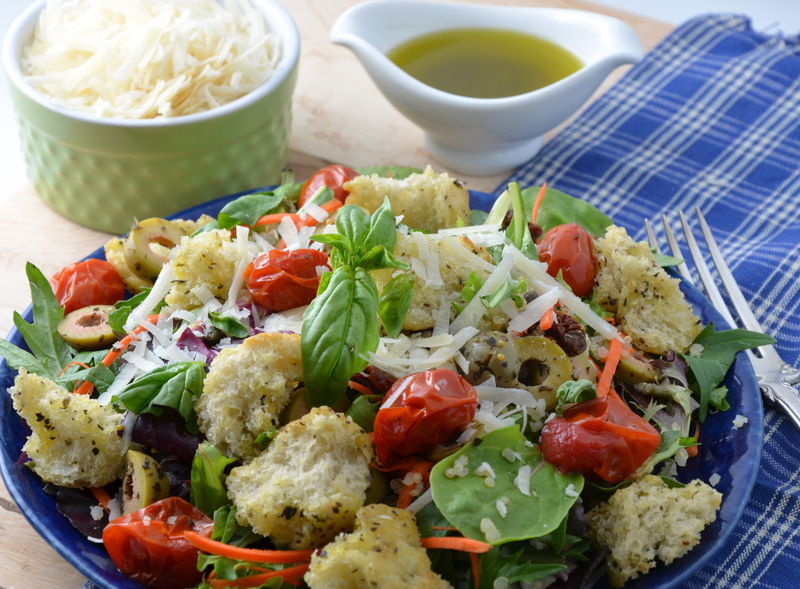 We love panzanella too! 😀 Those pictures are also great. And that header- lovely!